I think that says it all. I could not get enough of these. The LARABAR is truly energy in it’s purest form. 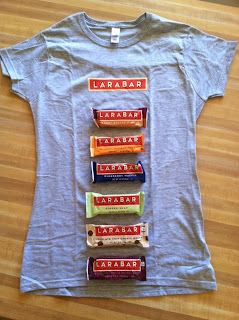 Most LARABARS have less than 200 calories to them. Here's a screenshot from LARABAR of the Chocolate Chip CherryTorte. LARABAR prides itself on using minimal ingredients to make these fine tasting bars. The sweet flavor of these bars comes from dates. The maximum amount of ingredients in one of the bars is 9 ingredients. That is amazing! I didn't have one of those 9 ingredient bars, but I will share with you the ingredient lists for the bars I did sample. So simple. I love it. And the flavor is outstanding. I love the fine texture each bar offered. When I opened the box, everyone stood around me like baby birds with their mouths open waiting for a sample. I really didn’t want to share, but kind of felt bad for them. So share I did. I didn’t share all of the bars. Are you kidding me? I only shared the Peanut Butter Cookie and Chocolate Chip Cherry Torte. Both bars received thumbs up from the Boudreau’s. There will not be any pics of these two bars because they were devoured within minutes. It was not pretty. I did stash away the Apple Pie and Lemon Bars for myself at a later date. I wasn’t sure what to think of the flavor names and wasn’t sure if I’d even enjoy them. But, man are they tasty! I highly recommend you get these and eat them. All of them. I'm already building my list for my next trip to Target so I can stock up. They make great grab & go snacks for anytime. I love to keep them in my desk at school so I can snack on them during the day. They are quite filling and good for you as well. 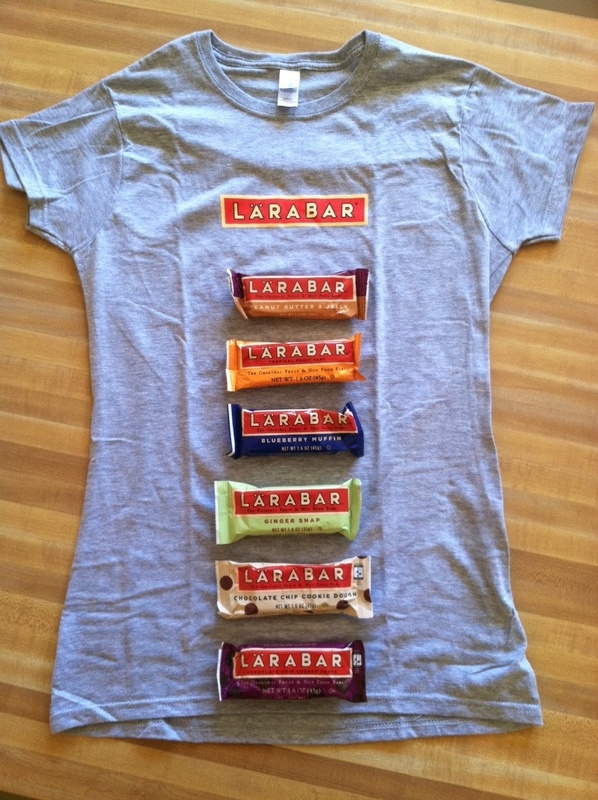 Do you want to win your own LARABAR supply? I was provided LARABAR to review and did not receive any further compensation. All opinions are 100% Boudreau and were not influenced by LARABAR. Mmm!! I really want to try the cappuccino flavor!! I love anything espresso flavored! I adore every flavor of Larabar I've had. I am dying to try lemon and cherry chocolate torte. Yum! I'm a peanut butter LaraBar freak. I'm HOOKED on the pecan pie and carrot cake larabars...I love their simple ingredients and that I can pronounce everything on their label. I've been eyeing the cashew cookie flavor, but haven't tried it yet! I LOVE ALL Larabars. I have not yet had the chance to try Cappuccino, and I would love to. I've been a Larabar fan for quite some time now. It's hard to find good, vegan bars! The Cashew Cookie is awesome and the Chocolate Cherry is so yummy! I love most of them! Apple pie and the chocolate cherry the most! I would love to try the Pecan Pie bars. I love Lara Bars, especially Cherry Pie!! Great giveaway!! They look yummy! I would love to try the Pecan Pie! I'd love to try them all!! I've tried them all, but Peanut Butter Cookie is my fav! i have never found the lemon bar and so so so want to try it - lemon is one of my favorite flavors! I would like to try the apple pie one! sounds yummy! Would love to try the blueberry muffin - perfect for breakfast! I would love to try their lemon or blueberry muffin flavors! Tummy! They look so yummy, i would love to try them all especially the apple pie! The peanut butter and jelly one!! I'd love to try the Pb&J! I want to try sooooo many. I've never had one :( I'm so out of the loop. I love the idea of the cookies and chocolate. or the pb one! blueberry muffin sounds great too.....I want them all. AND that shirt is cute. Mmmm... Apple Pie! Love LARABAR! I just told myself today "get to the store and buy some Larabars!" I would love to try the Lemon Bar flavor - I am lemon obsessed! I really want to try the Blueberry Muffin one... I absolutely love the Chocolate Chip Cookie Dough. LARABARS are an all-time favorite of mine! They work so well for long runs. The one flavor that I would like to try is the Cappuccino! It's the ONE I have not found anywhere! Peanut Butter Cookie is a flavor I haven't tried that - would love to find that one! Cashew cookie! I want to try that. Really, anything with cashews sounds great. I <3 chocolate chip cherry torte! so yummy! I've never tried a Lara Bar before - I'm thinking the apple would be right up my alley. Mmm. Coconut cream pie is fabulous! I have only tried an apple one and I didn't like it at all. I am intrigued by the Coconut Cream pie, though! Would love to try the blueberry muffin for breakfast! I haven't met a Larabar I didn't like!!! Mmmm. Love Larabars. I'd like to try the Chocolate Chip Cherry Torte or Coconut Cream Pie. I already know that Key Lime is yummy! I'm a relatively new runner and just found your blog - awesome! I can't wait to spend more time catching up. the Chocolate Chip Cherry Torte bar sounds amazing. Thanks for the giveaway! I want to try the new Chocolate Chip Cherry Torte among others! I'd love to try peanut butter cookie.